Episode 116: Is Inbound Still a Good Investment? Inspired by Mark Schaefer’s assertion that inbound costs increase over time, in this episode we unpack that idea and discuss the need for adaptation and adoption of inbound as a mindset rather than a methodology. 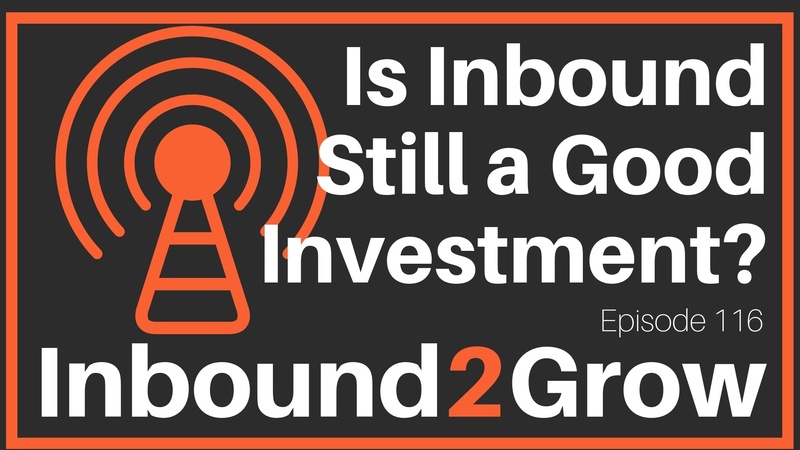 [1:50] Question: Is Inbound Still a Good Investment? The idea behind Schaefer’s post is that in the beginning, as companies invest in content creation and other inbound tactics, the investment is relatively low and easy to reach leads will find you because your niche is unsaturated. Over time however, as more content is created and the niche becomes saturated companies have to invest more in content creation to keep up. Companies spend more to increase the volume of content, the number of emails, advertising, etc. so inbound becomes more and more expensive. On the one hand, yes to do inbound requires an investment. Inbound isn’t free, and it isn’t magic. But the reality is that traditional outbound marketing is less effective than it has ever been. Your prospects will not tolerate canned cold calls, one-size-fits-all sales tactics, or pushy advertising. Prospects want an individual, personalized experiences. They want to do their research before talking to a salesperson. They want the companies they work with to help them solve their problems, not just peddle a product. They want, in short, inbound. Of course, if you begin to create content in an unsaturated niche leads will be easy to find. Of course, as time goes on, there are fewer easy leads. Yes, inbound requires continuous investment in creating amazing, high-quality, helpful content. However, inbound is still more effective than traditional tactics, and it should be less overhead. As for spending more to create greater quantities of content, that idea really misses the heart of what inbound is. If your emails, blog, whatever tactic isn’t working well then, the answer isn’t to produce more mediocre content and hope that if two emails a week weren’t working four will. You should know your persona, their struggles, their goals, their preferences and that knowledge should inform the types of content you are creating. You should be creating content for your niche that they will love. You should be spending your money better! If your persona isn’t into long format blog posts, ditch them. If your persona wants a short format podcast (something we know a little something about), then you should be spending your money and time creating short format podcast episodes not 1000+ word blog posts. Inbound isn’t a bucket of tactics (emails, blogs, etc.) that you are bound to follow slavishly, throwing money hand over fist at the tactics and hoping they work. Inbound is a mindset that should permeate your entire organization. Inbound is about all levels of your company helping your prospects solve their problems. Helping requires an investment, sure, but being helpful is more effective and, ultimately, less costly than traditional marketing methods. If the inbound tactics you are using aren’t working and are eating up more and more of your budget, then it’s time to take a step back and figure out how your prospects want to be helped, where they want to be helped, and when they want to be helped and then go give it to them! Inbound is a mindset, not just tactics or a methodology. Is your content strategically focused on the changing needs of your buyers or is it focused on your product?